UFC‘s undisputed biggest star Conor McGregor will appear tonight … deep in the heat of controversy … on Bellator 187‘s broadcast! McGregor jumped the cage fence to celebrate with his teammate Charlie Ward after Ward scored a dramatic, nail-biting victory over John Redmond in the final seconds of the first round at Bellator 187 in Dublin just hours ago. As soon as Ward scored the TKO, McGregor (who is not a licensed cornerman) jumped into the cage to celebrate with Ward. Referee Marc Goddard, who has a history with McGregor, immediately told him to leave the cage, which one can clearly see caused McGregor to lose his temper. McGregor then shouted back at Goddard and eventually shoved Goddard as he was checking on Redmond, who was still kneeling on the mat. Goddard did not shove McGregor back. Moments later, McGregor was escorted out and left the cage on his own. Goddard is the same official who ordered McGregor to leave cageside as he cheered Artem Lobov on at UFC Gdansk. 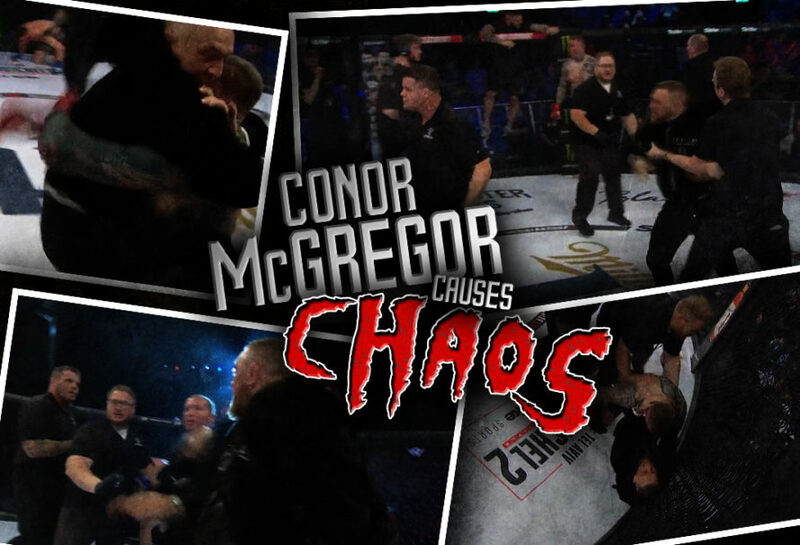 When McGregor initially left the cage, he turned around and ran back into the enclosure shouting “that was a fiucking stoppage” before he was again asked to leave. After his final exit from the cage, he did a lap of the stage waving to the fans in attendance. Another video obtained by TMZ shows McGregor slapping a security guard trying to get back in the cage again. This could end up being an incident with loads of consequences. And perhaps it leads to nothing. Either way, we’ll soon find out! We’re HustleTweeting about Conor McGregor, and you’re more than welcome to join the conversation by following the Hustle on Twitter HERE or by hitting LIKE on our hyper-interactive Facebook page HERE!